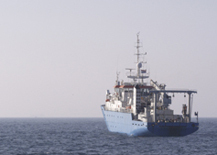 The Laboratoire Arago – Observatoire Océanologique de Banyuls/Mer is operated by the UPMC-Paris 06 with two research and engineering partners (CNRS, INSU). Prof. Philippe Lebaron established the MOLA collection in 2001, and we now maintain 2522 environmental bacterial strains in our collection, with new ones being added each week. Microorganisms are isolated from samples taken during oceanographic cruises all over the globe: from oligotrophic waters to the most eutrophic, at the water interface with air or sediments, or from the water column. We also isolate symbiotic bacteria associated with animals. Our broad experience with samples from different marine environments is an important advantage when developing the new and innovative culture methods used to target the unique microbial species in MOLA. Because our facilities are situated in a marine sciences research and teaching laboratory, (the Laboratoire Arago - Observatoire Océanologique de Banyuls/Mer) we also benefit from the latest research breakthroughs. The MOLA collection is registered with the World Data Centre for Microorganisms (WDCM911) in the World Federation for Culture Collections (WFCC). The collection has been supported by the European research project AIRWIN (Air-Water Interface), and the Institut Français de la Biodiversité (IFB).